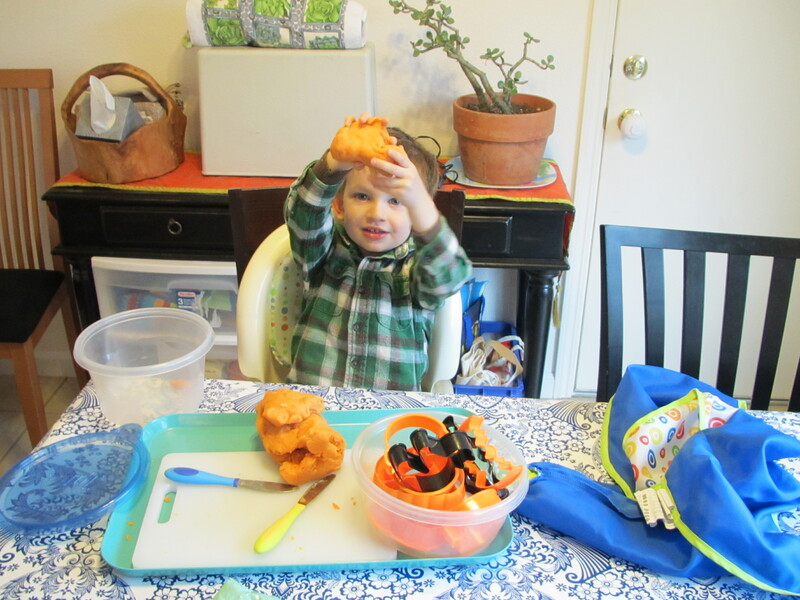 About a month ago I discovered a really simple homemade play-dough recipe, and made two batches in Halloween orange. Once it cooled, it was an instant success. O enjoys rolling and cutting the dough, and it keeps him fairly occupied for about 20 minutes twice a day. O also likes to build ships. These ships go through the air. They go “up-up-up” and “dum-dum-dum” and “zoom.” I asked him for clarification, they are not boats. Boats go in the wah-way (water), everyone knows that. Ships fie (fly). O has a very creative imagination… and perhaps we watched a bit too much StarTrek when we had a round of Toddler Plague a few weeks back. yep, another month has gone by!